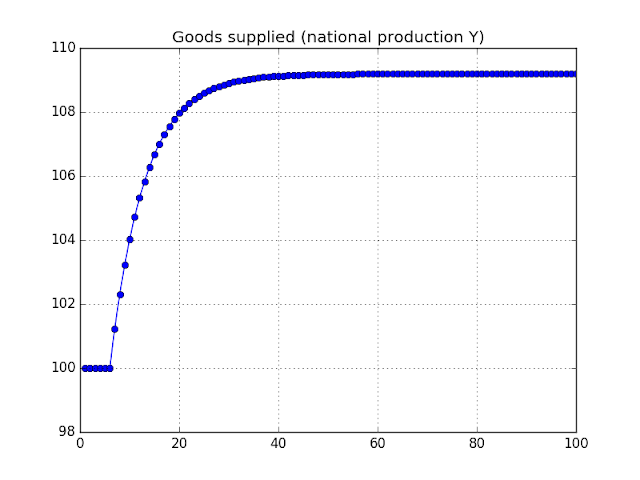 The interest rate is raised at t=5, causing output to rise. This article will be unfortunately brief. I started working on an adding financial asset markets to my Python Stock-Flow Consistent (SFC) Model library, and I was ambushed by various bugs. (As various economists have remarked, it is a bad idea to mix up stocks and flows.) It looks like the code is working, but I still want to look over the results before making longer commentary. However, the code did reproduce one of the distinctive implications of SFC models: raising the rate of interest increases national production (in nominal terms, at least). The result -- which is presumably heretical amongst central bankers -- follows from the financial flow effects of the interest rate hike. In the chart above, the interest rate starts at 0%, and then there is a rate hike in the fifth time period. The model makes no attempt to take into account any behavioural changes caused by higher interest rates (which is what causes standard mainstream analysis to argue that interest rate hikes slow activity). We would need a more sophisticated model to properly deal with that debate, and I am currently ramping up my modelling framework to take on questions like that. The problem with SFC models is that they have too many equations. However, this reflects the reality that the number of inter-connections amongst multiple sectors and markets explodes as we add to model complexity. However, we need to add that complexity if we wish to capture interesting phenomena. In the current instance, the number of equations made it difficult to track down the issues with my machine-generated equations. However, now that it looks like the financial markets have been properly integrated, I have dealt with one of the few remaining system generation issues. Going forward, the only areas of concern I have involve adding more sophisticated equation solution techniques. Another example is the debt to GDP ratio in which government debt is specified in dollars, measured as a stock of financial assets and liabilities, while GDP is specified in dollars per year, an estimate of the value of real goods and services produced over an arbitrary period of time. Is this ratio of a financial stock to a flow of goods and services over time actually meaningful? I don't recall a reference to this concept, I read it somewhere, and lost track of the source. One could imagine a small region in which there is one bank, one large firm (a company town) that builds houses, a few hundred households, and a small government, where working class households draw wages via employment in the bank, the government, or the firm to make payments on a mortgage or otherwise save. There should be a few wealthy households that own equity in the bank and firm, and many working class households that owe debts to the bank. The stocks and flows in this model could be tracked on the bank and firm balance sheet and the valuation of houses could be modeled by a mark-to-market assumption. I think this would provide for a comprehensible example of how financial deals drive cash flow, wages, valuation of houses, and valuation of equity over time. Experiments with various conditions would show a pattern of sustainable finance or bubble finance via overshoot and collapse of house prices based on finance at the bank and firm. The wages would always appear in the bank, firm, and government as costs, and the profit would only appear while a sufficient number of working class households can rollover and take up debt in the estimation of the bankers and firm managers. Another model is just have a company town that makes houses, and the workers draw wages, while the company town holds their mortgage! In this way the town resembles a large government with a finance and production model, however, instead of taxing citizens, it pays less wages to its employees then they must take up in debt, so workers are always in debt to the company town owners. The idea for company town accounting schemes comes from the song lyrics I remember as follows: "You load sixteen ton and what do ya get? Another day older and deeper in debt. Saint Peter don't you call me cause I can't go. I owe my soul to the company store." 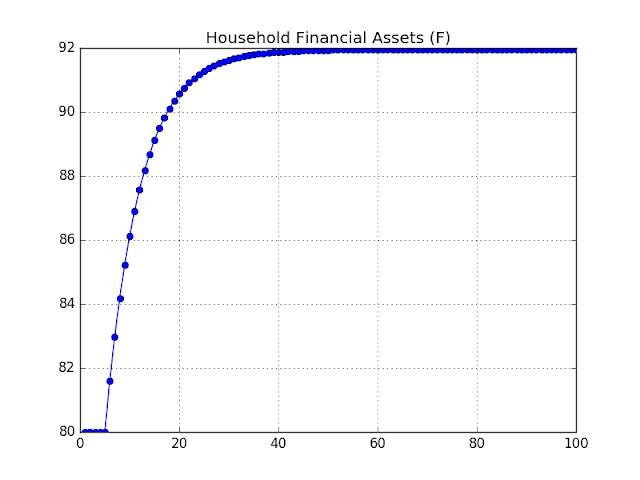 In SFC models, there is a concept of a stock-flow norm. The idea is that entities have behavioural rules to relate stocks to foows. In addition to debt/income (which is what debt/GDP really is), there are things like inventories/sales ratio. And in the real world, decisions are made upon those ratios, even though the units are not directly comparable. 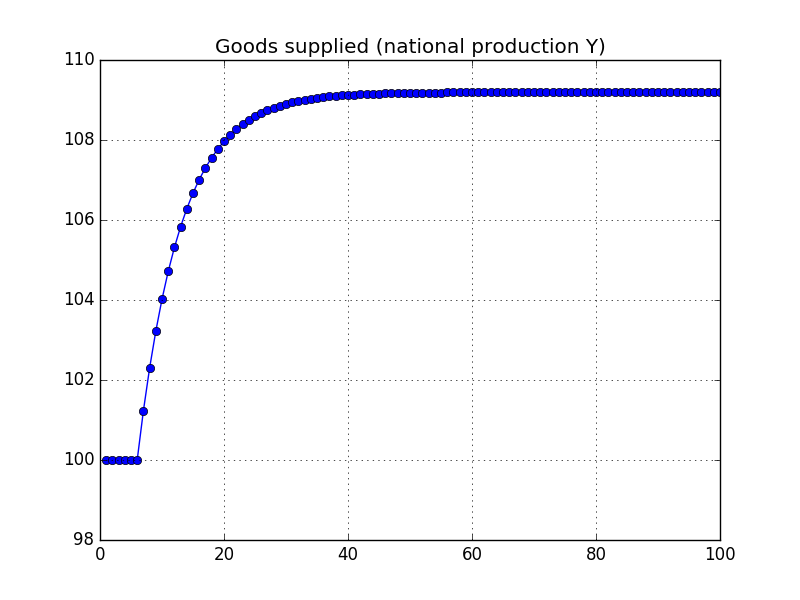 This means that a debt/GDP ratio could be meaningful, but there is no reason to exepect that any particular number is (since the units change). And to be more charitable to myself than my comments indicated, I did not actually mix up stock and flow variables. Instead, I mistakenly used the term (1+r) to calculate interest by habit, instead of just r. The (1+r) is what happens the stock of debt, the r is what applies to the flow. Although it should have been obvious, the massive compound growth from period to period made it look like my system was not converging, when it actually was. (My solver is currently crude.) The number of equations made it hard to see the error. The government does not accumulate GDP as income to pay down its debt over time, but rather, it increases its debt to keep taxes down when spending is authorized, and it rolls over its debt to keep GDP flowing. If no external creditor can force the government to pay down its debt then it does not have to pay down its debt over time but merely rolls it over to finance the policies the benefit the nation.